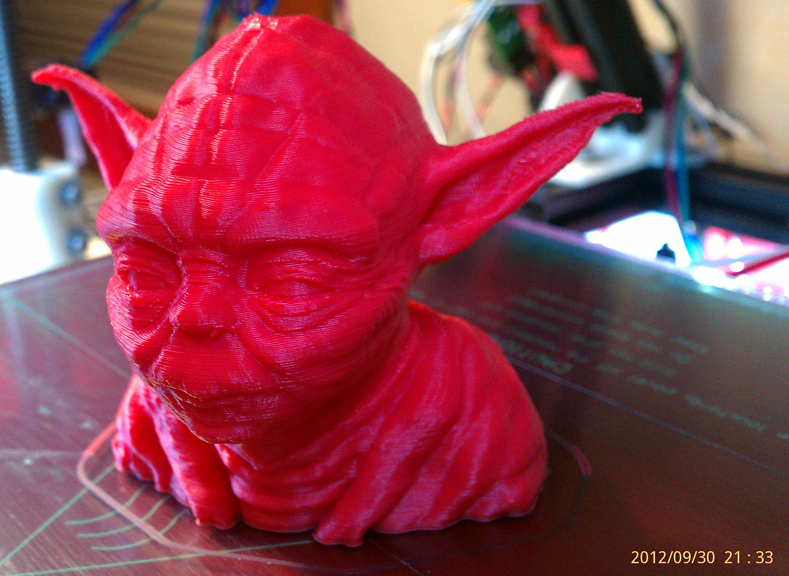 I thought it'd be fun to revisit a classic print, Yoda-Lite by Faberdasher. Edited 4 time(s). Last edit at 09/28/2012 04:43PM by rhysjones. 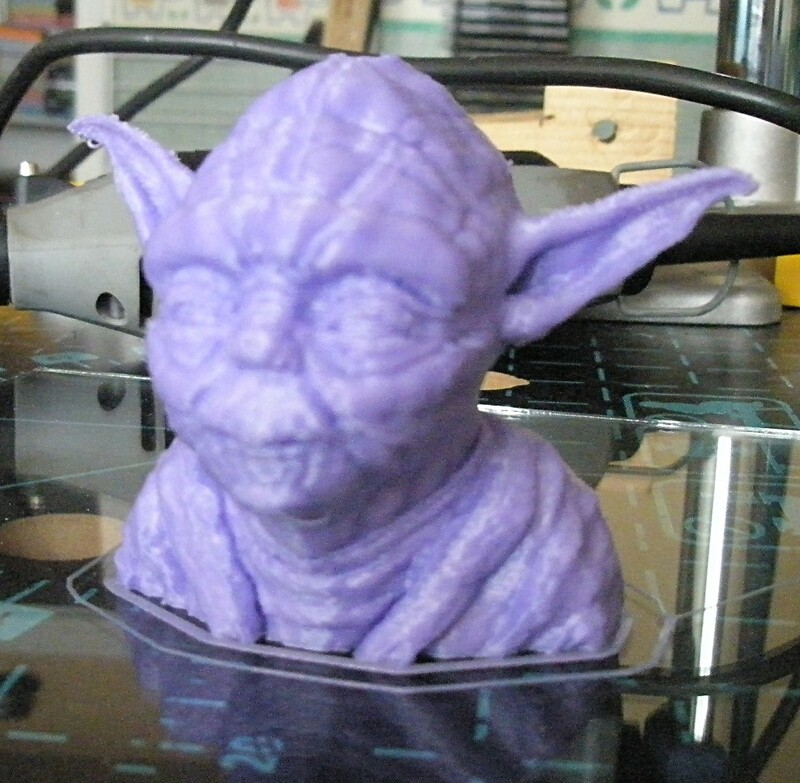 This was my third attempt at printing Yoda, so I've picked up a few ideas from my previous tries. I'm fortunate in having some nice green ABS handy and I definitely think he looks best in green. The ABS seemed to cope better with the steep overhangs than my PLA prints from the last competition. Printed at 0.15 mm layer height with 35% infill and at 40 mm/s. There are no very small layers so I kept my ducted fan down to a gentle breeze to try and avoid the delamination splitting that has been a problem with large models in the past. There is one tiny split near the left eye, but nothing disastrous. This is a detailed model that copes well with being scaled up so I chose a height of 10 cm for this print. I wish I had read this post before I started printing, instead of after. If I had used the SD card there might have been a few less blobs. There are more pictures in this folder. My secret weapon is something I've been experimenting with lately. It's a process that involves turning a model into a shell by using Blender to place a scaled down, low-poly copy of the original inside the model and then doing a Boolean subtract. This solves the problems I had previously where zero or low infill doesn't provide enough support for the top of the head but medium infill wastes a huge amount of plastic. Can you shed a little light on the method you use to create the low polygon inner shell? I can see some problems when doing a scaled down torus for instance, the inner wall and the outer wall would intersect on the inside of the torus. The best method I have found so far is to load the model in Blender then go into Edit mode and use a combination of "Scripts / PolyReducer" and "Transform / Shrink/Fatten along normals". I think this latter one might work for your torus example. It isn't fully automatic and it doesn't work everywhere. I had to edit some of the the vertices to accommodate the indentations of the mouth and ear-holes and extend the bottom downwards to cut a hole in the base. I also checked for non-manifold edges using Ctrl-Shift-Alt-M and edited them manually. 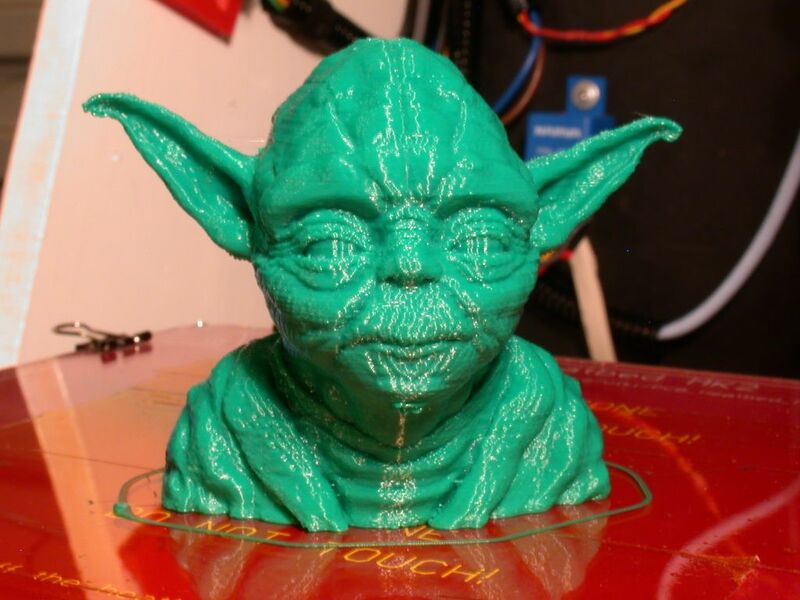 You can also slice the model a few times at different infills, and manually select by layer height change - join the Gcode text files together, for Yoda do just a hollow shell up to his shoulders, add 15% infill upto the neck, then 30% higher, finishing off with 60% for the top of the head. 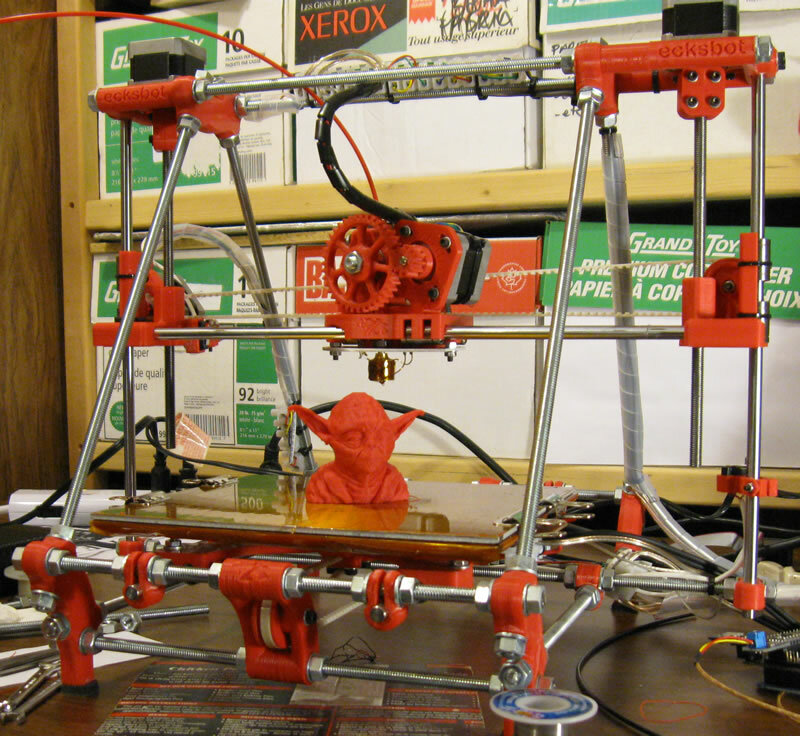 In Slic3r this whole process only takes a few minutes. with Skeinforge, about 6 hours. With some translucent plastic's you can see the different fills, and even with some opaque it's better to use 2+ perimeters to disguise the variable infill. thx for the tips, i'll give it a try when i run into this problem. 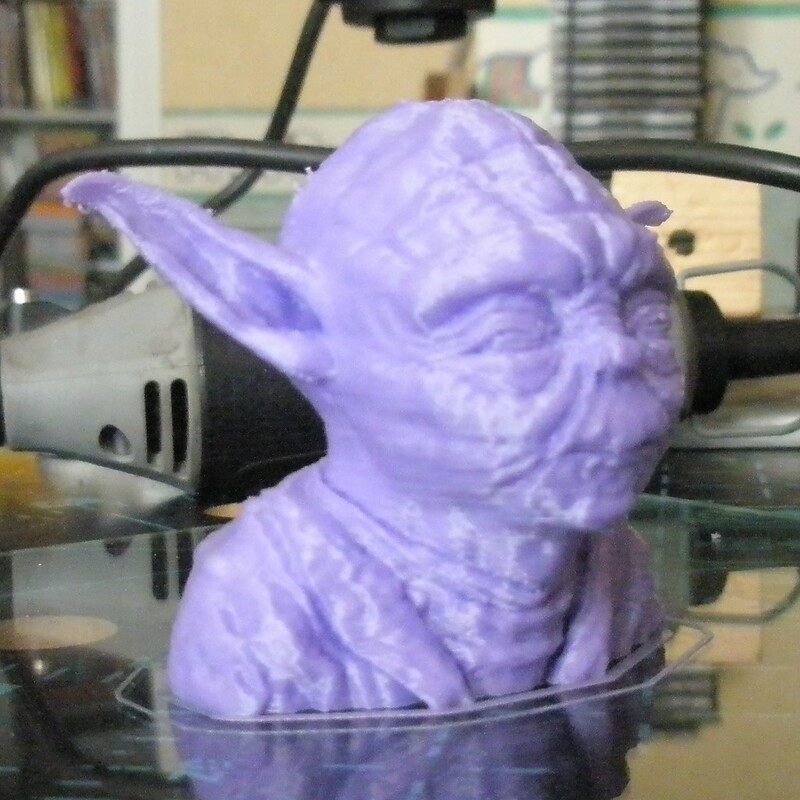 Although my printer is currently no longer working (I need to make an adaptor to connect my arcol v3 hotend to a wade's extruder after my wire solution started becoming flexible...), following this sub-forum has been a source of much learning. Bit of a hurry to participate before I dismantle/rebuild my whole X axis / extruder combo. This was sliced with skeinforge, 0.15 layers, pla is from diamond age. Should I include more settings details ? I still have a hard time taking pictures that are not blurry. Not to hi-jack this thread but the easiest way to make a hollow model in blender is to remove one small face where it will not visible and then use the solidify modifier which will create an offset shell a specified distance from the original. This avoids the problem found with trying to subtract a torus from a torus. That's what I love about this thread - the opportunity to learn unexpected new things. I've never heard of the 'solidify modifier'; in fact I couldn't even find it in my version of Blender, but then I am one of those quaint 2.49b devotees who couldn't adjust to the new style interface in 2.50+. Maybe I'll just have to give it another go. It does sound like a very useful tool. @Sublime - Personally I'd say that's exactly the kind of tip that these threads are good for! I've done the same, that is shelling an object, in Meshlab, not knowing Blender at all. After scanning, with an MS Kinect and reconstructme, the 2.6m tall statue of Alan Turing at University of Surrey that the Thames Valley RepRap User Group planned on printing at the Brighton Makerfaire (we didn't get very far on the day! ), I created a model in Meshlab from the various mesh scans, and created a single mesh with the Poisson filter reconstruction. Using the Uniform Mesh Resampling filter (under Filters / Remeshing...), you can set the absolute value of the Offset (under 'world unit') to a negative number. Meshlab eventually produces an inner shell. Invert the normals, then flatten the layers so you have an inner and outer shell (when Meshlab doesn't crash! I had to run Meshlab under Windows 7 rather than OSX to get this to work). However, I then had real problems as I tried to cut the model up into printable pieces in Netfabb Studio Basic; Netfabb kept closing the surface in the wrong place, as the inner and outer shell are not connected. In the end, I imported a cut down version (Openscad couldn't handle large blocks, and had various other problems dealing with the volumes) of both the inner and outer mesh into openscad, and differenced one from the other to get a viable model that I could cut into pieces in Netfabb. 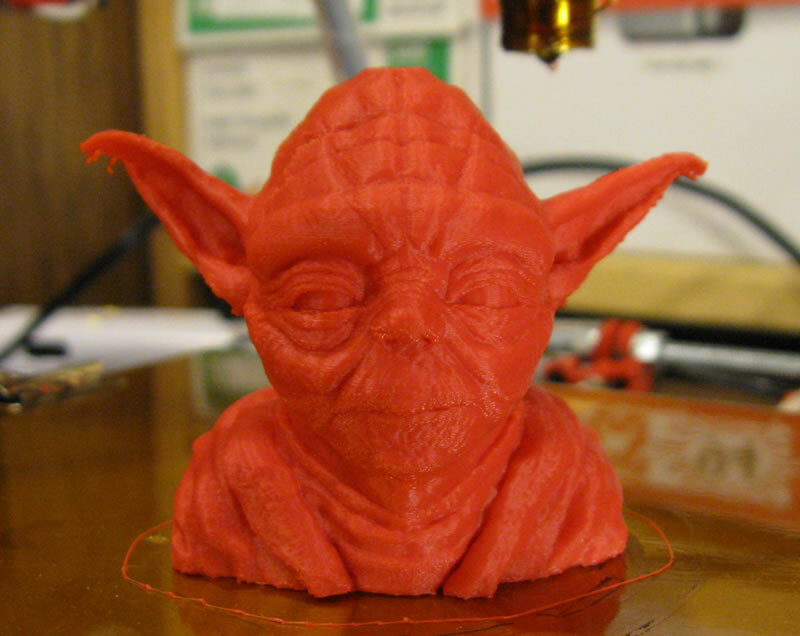 Not sure if i qualify for entry as a printed off a slightly different version of the yoda bust. I do have a slight issue where the top of his head, ears and sholders are not completely filled, but I'm still proud of it. I gave it a try as well. This was printed on my "new" printer. Could not resist giving it a try. Nozzle 240 and bed 104 degrees. 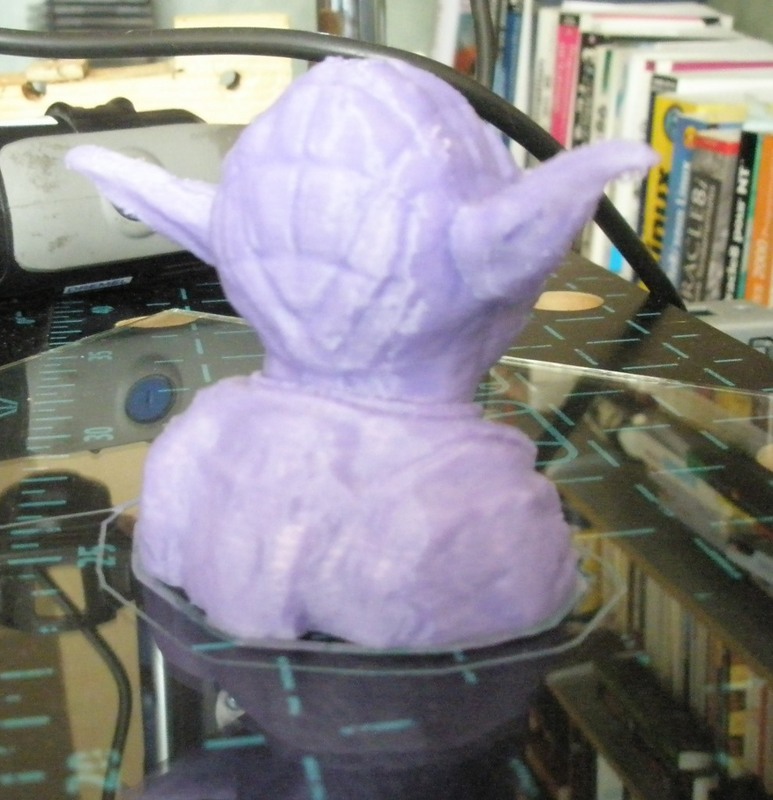 I also noticed some minor problems on top of head, but a fun print to do. Working on getting a fan for cooling small layers, hoping that will improve the print quality. Thought I would try printing this on an ecksbot. Had a couple of issues around the tops of the ears and it looks like he has a booger on his nose, lol. Printed on SD ramps. Here's my attempt with silver PLA. What printer was it made on? > What printer was it made on? Everyone - Ok time to up the ante. Sat under my bed is a 100m coil of 1.75mm Faberdashery arctic blue PLA, not to sound like a commercial but I've tried filament from loads of sources over the years and their filament is the best by quite a margin, even if it is the most expensive. Anyway I don't have any plans for it in the immediate future. It can be a nice prize to the winner if they have any use for it. In the event that they don't/run 3mm filament I'll roll the prize over to the next competition. Edited 3 time(s). Last edit at 09/28/2012 05:46PM by rhysjones. Also I'm a tad busy on Sunday so I won't be able to judge it then. If anyone has any last minute entries, feel free to post until the end of the 30th. 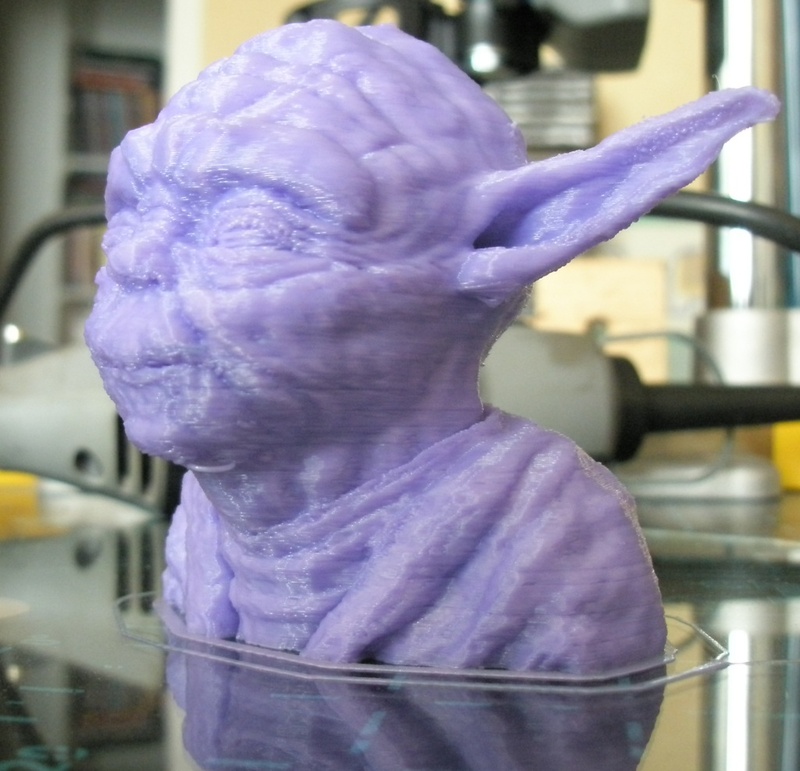 Thats a Pretty nice Yoda Nodeva! Your layer height is very specific, any particular reason you went to that many decimal places? Well it's decision time. Overall the standard was really high, and it was pretty tough making a decision - pretty much everyone was a contender. Jaramaniac and Iceman both had really nice prints on the whole, but it seems like there is a little bit of Z wobble. Nodeva did an awesome print considering they've only been up and running a couple of weeks. 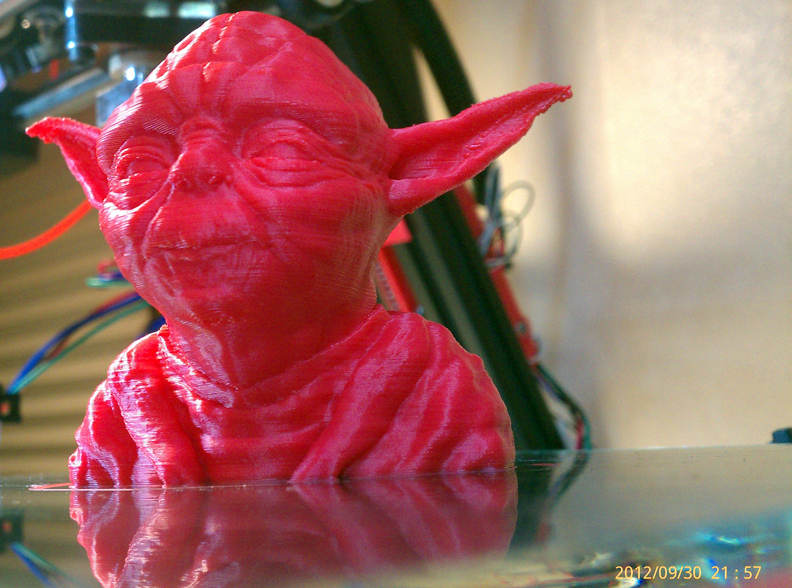 Richgain had a very nice print on the whole too, although there were a couple of warts apparent(bowden issues? 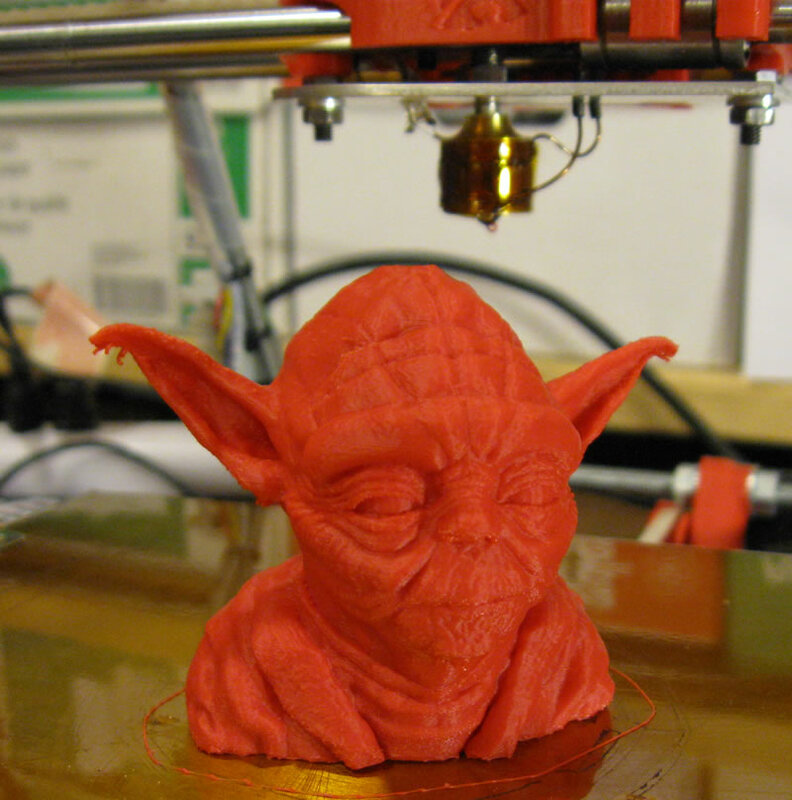 ), eckertech and Deuxvis also had awesome prints, but there was the odd blemish around the ears. OoiTY - I'd say there were areas where other people had slightly better quality, but on the whole I think his was the best overall - it was just soooo nice. 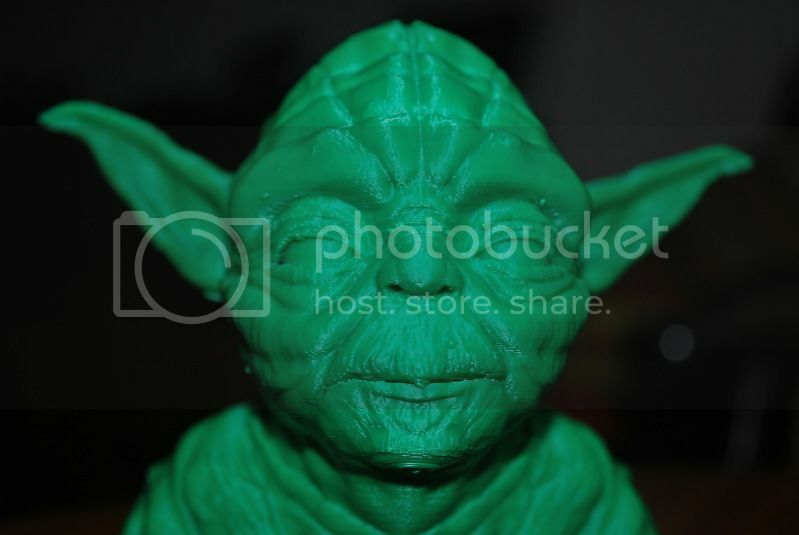 > Thats a Pretty nice Yoda Nodeva! > reason you went to that many decimal places? No real reason. 0.1693 should have sufficed. I use a 3/8" lead screw with 12 turns per inch of travel. Each turn would be 0.0833333 inches of travel or 2.1166667 mm. If you divide that by 200 steps you get a z travel of 0.0105833 mm per whole step. Using even multiples of this number will mitigate missteps. I realize that 1/16 micro stepping would provide 3200 steps but I feel that matching the mechanical system (200 physical steps) makes more sense for the z movements IMHO. Thoughts? Sorry I didn't get a chance to enter this time. I did get as far as slicing and mixing three lots of Gcode, but not printing, yet. 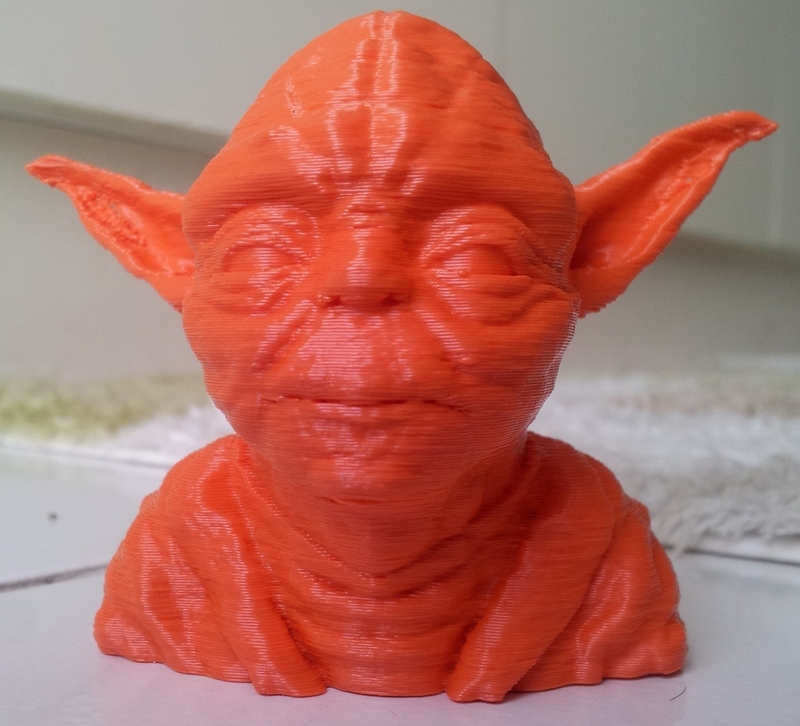 Well done OoiTY, very nice print! Thanks for a very interesting and fun competition and congratulations to OoiTY, well done! "Jaramaniac and Iceman both had really nice prints on the whole, but it seems like there is a little bit of Z wobble." Yes I do have some wobble in my Z axis. I am working on it as I think it is the bearings sitting a bit loose on the rods. Waiting for adjustable bearings and hope that will improve it. > No real reason. 0.1693 should have sufficed. > the z movements IMHO. Thoughts? Hahaha I was just curious, I am only just new myself, only been actually printing for about 3 weeks. Thanks for posting that link to RichRaps Slic3r guide!, I have been looking for someone that could explain how to configure it, so many of the features are not as obvious about what they affect as I would like. And Congratulations OoiTY!, your print is indeed very nice, I was particularly impressed with the ears! > bit of Z wobble. RhysJones - I have to ask - how can you tell? What was there on these prints which told you that there was 'Z wobble'? To everyone who posted their prints - brilliant!